Paarl is built in the picturesque Berg River Valley, situated at the foot of the second-largest granite outcrop in the world. It is the biggest town in the Cape Winelands and the third oldest European settlement in South Africa. Paarl features some of the most superb examples of Cape Dutch, Victorian, Edwardian, and Art Deco architecture in the country. Its rich history includes Drakenstein Prison, where Nelson Mandela spent his last years in captivity. The Language Monument, overlooking the town from the slopes of the Paarl Mountain, symbolising the birth of the Afrikaans language. Along with its historical background, Paarl is also known for its award-winning wines, particularly its reds, which can be sampled along one of the world's first 'Red Routes'. Paarl's wine route includes more than 40 cellars, among them Nederburg and KWV, and many of them also making a variety of delicious cheeses. 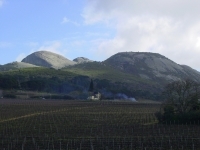 Paarl Mountain, or Paarl Rock, looms above the town and is sometimes compared to Ayers Rock in Australia, although geologically they are very different. The rock is popular with climbers, but the routes are difficult and should not be attempted by the inexperienced. There are also many hikes and scenic drives in the verdant natural surroundings.